​K-8 Walk to School Day has been moved to Thurs. Oct. 11 due to forecast. Dress for cold weather. K-8 Walk to School Day has been moved to Thurs. Oct. 11 due to forecast. Dress for cold weather. 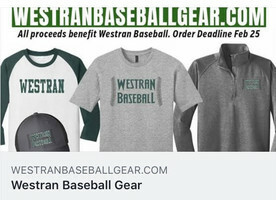 Support your team with the latest Westran Baseball Gear at www.westranbaseballgear.com Order deadline is Feb 25, so don't wait! On Friday December 8th Mrs. Suzi Carter was awarded the 2017 STOM (Science Teachers of Missouri) award for going the extra mile teaching Science in the classroom. Congratulations to Mrs. Carter on this accomplishment and for the effort she puts in for the 2nd grade students at Westran Elementary. COPYRIGHT © Westran School District 2017. All Rights Reserved.